Editor’s note, Oct. 16, 2012: After getting too many notes about this place from disappointed diners who had been served substandard food or had their check inflated, we sadly need to move this fish spot onto our “no longer recommended” list. 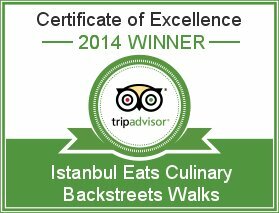 For those looking for a good fish shack on the Golden Horn, check out this review. For good reason, there is a well-beaten path to Karaköy Balıkçısı, an excellent fish restaurant in Perşembe Pazarı, a district near the Golden Horn filled with small shops selling power tools and bathroom fixtures. The fish there is superb, as it should be for a lunch that can cost $40 per person, with no booze. That’s fine for a birthday, but what about the other 364 lunches of the year? A solution has appeared. Just around the corner from the fish market at the base of the Galata Bridge in Karaköy, we found Akın Balık, a bare-bones fish restaurant hugging the wall of what appears to be an otherwise abandoned building. One of several outdoor fish places in the area, set back just a few steps from the Golden Horn’s edge, the restaurant has a laid-back vibe that makes us feel like we’re no longer in the big city but instead relaxing in some seaside village. We like to head over there for an early dinner as the sun sets over the Golden Horn, lighting the water up with a coppery hue. (Borders in this patch of table-cluttered land are ill-defined and relations between the restaurant owners decidedly Balkan, so be sure to confirm that you are sitting at Akın, not some breakaway wannabe.) At this time of day down here, as the last shopkeeper noisily pulls down a security grate and commuters hustle onto honking ferries bound for the Asian side of Istanbul, Karaköy seems to sigh and relax for the evening. This is the time to be at Akın Balık. 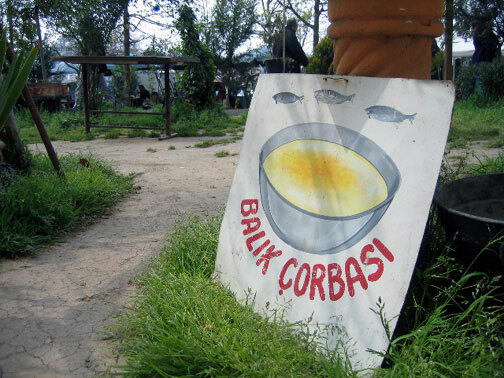 Unlike most of the other simple fish joints around here, which exclusively sling sandwiches or sardine fry-ups, Akın serves a tasty fish soup everyday. The hearty, almost chowder-like, fish stock is amped up by bright carrot slivers, chopped parsley and an optional squeeze of lemon. Akın is also a reliable place to try some those street foods that we are not quite comfortable buying from Istanbul’s roving teenage shellfish dealers. Fried mussels or mussels stuffed with rice are fresh and well-prepared here. But be forewarned, they often run out before nightfall. Whole grilled fish, be it levrek (sea bass), çupra (sea bream), or sarıkanat (small blue fish) is about as fresh as it gets. Some are still even swimming when they are picked up every morning from the fish market right next door. However, we suggest an old Istanbul street food favorite that used to be sold from boats on the Golden Horn: the fish sandwich. A grilled bonito filet nestled in a hollowed-out half loaf of crusty white bread, dressed with onions, parsley and lettuce, is a simple pleasure that goes perfectly with sitting on a stool in the setting sun while drinking Efes beer from a can wrapped in brown paper. A meal here – including that beer – costs less than $10. Now that’s a meal you don’t have to save for a special occasion. I have assiduously kept this (totally rockin) place a secret for soooo many years, per a sacred promise to the friend that first shared it with me- am relieved beyond words that I can now throw up my hands, say Istanbul Eats blew the cover, and raise a paper-bagged Efes to Akin-Bey with whomever I please! Thanks, guys! Wandered into Akin Balik on a cold rainy night in search of a fresh and healthy dinner alternative to doner. I was tempted by the mezze platter complete with marinated anchovies, olives, eggplant salad, cheese, anchovies rolled around olives, cucumbers, octopus, and marinated red peppers. Sounds wonderful on such a grim evening, eh? Well, the contents of the plate came floating in a pond of oil and everything but the cheese and cukes were inedibly salty. The benefits of Turkish food are the oil and salt at times, but Akin Balik knows no moderation. When I asked for the bill (with a slight stomach ache and yearn for copious amounts of water), the woman tried to charge me double. I protested and she realized I wasn’t another oblivious foreigner, so she conceded to the original price and I left. This place is dripping with quaint atmosphere but be forewarned to keep your guard up about the mezzes and the bill. speaking of “an old Istanbul street food favorite that used to be sold from boats on the Golden Horn: the fish sandwich”– can good ones be gotten from the stands under the galata bridge? which one? That’s a good question. We usually only head to the beer and nargile joints under the bridge. Perhaps some readers out there know? for a really nice fish sandwich you need to go inside the narrow streets of Karakoy; with Kadıköy port on your right side, walk towards Karakoy Güllüoğlu through parking lot and smell the air; it should lead you to them. fish sandwich from the boats arent bonito,they are imported from northern countries such as norway,(frozen mackerel)because its cheaperden local fish.sory to say that. Had lunch there today 15/01/2012. 2 soups 1 salad, red mullet for 2 & 2 Efes TRY72 . Waiter asked for a tip. this patch of fish places has changed at lightening speed over the past couple of years. As word spread, the bags came off the beer cans, tables ceased to be collapsible, and proprietors got greedy. Very sad. The review a few months back, of Kemal’in Yeri, heads you in the right direction- keep on walking, past the bright lights and be-suited waiters. Rule of thumb: the less fancy a place looks, the better the fare. Thanks for the information. We’ll be following up on your report of Akin. 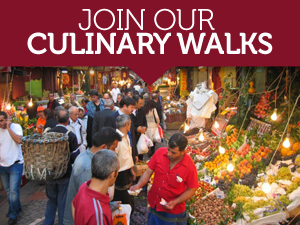 Along with Kemal’in Yeri, we do have a couple more yet-to-be-spoiled spots for no frills fish in the Karakoy market area. We will update with those soon. 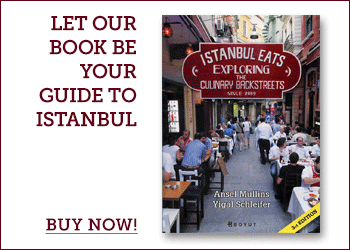 We found Akin balik restaurant last summer ’12 with our Istanbul gastronomic guide ( in French) . The atmosphere on the outside terrace is delighful and friendly , amazing when you know you are in center of Istanbul , 100 meters from Galata bridge ! Reservation is not required , thus our guide recommended to do . Don’t be surprised : there’s no menu and no prices !!! . You have to ask the personnel and to choose your fish ; they are used to explain everything to foreign customers . We return there another evening …. I am glad this restaurant no longer appears in the latest edition of Istanbul Eats (Love your book, by the way). I was at Akin Balik over two years ago and loved it – the location was great, the service pretty good, and there was a pretty relaxed, celebratory feel. I just went with a friend today. First, they wouldn’t seat us close to the sea because we were two men; they said they worry that men will get drunk and harass women. Yet, there were three men sitting together in our section We moved and asked our new waiter about this and complained and he basically told us “This is Turkey. If you don’t like it, go to a restaurant in Europe.” Needless to say, I will never go back there.